A Roman Option for Lutherans? Update: There is now a Norwegian version of this post. Today I got my copy of William Oddie’s book The Roman Option. 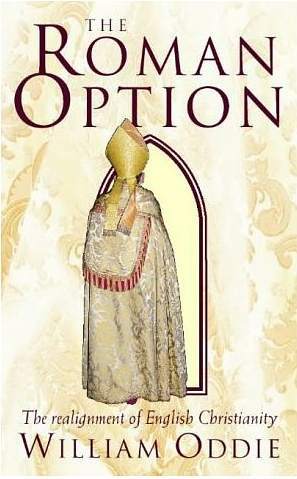 Written in 1997, in the aftermath of the 1992 decision of the Church of England to ordain women to the priesthood, it explores the possibility of a ‘Roman option’ for ‘disaffected’ Anglicans. Some have compared Oddie’s proposals to the decision of Pope Benedict XVI to allow (Catholic-minded) Anglicans to convert corporately to the Catholic Church, while retaining certain elements of their Anglican patrimony, and I know some Anglicans personally who have rejected the proposal of the Pope, favouring rather an (conservative) Old Catholic solution, and who refer to the proposal of the Pope as ‘the Roman Option.’ I have not yet (started to) read the book, but plan to do it in the not so distant future, but I believe some remarks are in order. Is there room for a Catholic ecclesiology in the Church of Norway, or in any given Lutheran church? Is there such a thing as a ‘non-papal Catholicism’? Do we have to be in communion with Rome? Are there any compelling reasons not to be in communion with Rome in our present situation? I am not going to answer these here, but they might be a good starting point for a discussion. With these thought in mind, I recommend reading this post (and the subsequent discussion) concerning comments from the President of the Pontifical Council for Christian Unity, Kurt Cardinal Koch, on the possibility of a Lutheran ordinariate. William Oddie, The Roman Option: Crisis and the realignment of English-speaking Christianity (London: HarperCollins 1997). See here, here and here. For an introduction to Pope Benedict’s proposal, see Wikipedia. Also read the ‘founding documents,’ Anglicanorum Coetibus and its complementary norms. Here, here and here are links to the three main Catholic-anglican personal ordinariates in England/Wales, USA and Australia, respectively. One person I know has seeked union with the PNCC and the Nordic-Catholic Church. See Arve Brunvoll, Vedkjenningsskriftene åt Den norske kyrkja (Ny omsetjing med innleiingar og notar. Oslo: Lunde 1979). I am probably only self-imposedly bound by this as a layman, but should I be ordained in the Church of Norway, I will be bound to it canonically, through my vows at the ordination. For some considerations of the Catholicity of the Augsburg Confession, see Wolfhart Pannenberg, «The Confessio Augustana as a Catholic Confession and a Basis for the Unity of the Church» (in The Role of the Augsburg Confession: Catholic and Lutheran Views, ed., Joseph A. Burgess. Philadelphia, PA: Fortress Press 1980), pp.27-45; Joseph Ratzinger, «Elucidations of the Question of a “Recognition” of the Confessio Augustana by the Catholic Church» (in Ratzinger, Principles of Catholic Theology. San Francisco, CA: Ignatius Press 1987), pp.27-45; and Avery Dulles, S.J., «The Catholicity of the Augsburg Confession» (The Journal of Religion 63:4, 1983), pp.337-354. Next postEit ‘romersk alternativ’ for lutheranarar?